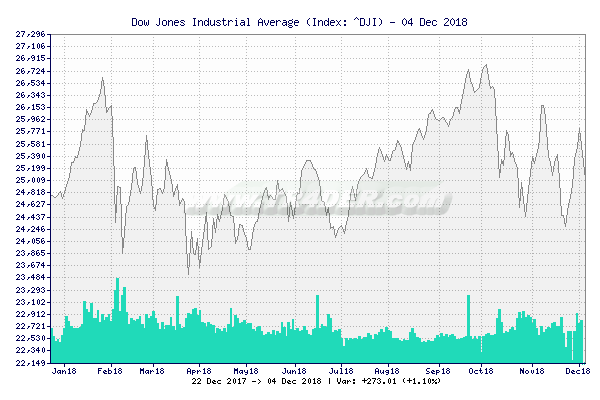 TR4DER - Put a Dow Jones Industrial Average [^DJI] chart on your website! Last Minute: "Fox News Poll: Interest in 2020 already at Election Day levels - Fox News" Thu, 18 Apr 2019 21:56:52 GMT "Mueller Exposes Erik Prince's Lies About Russian Rendezvous - The Daily Beast" Thu, 18 Apr 2019 22:56:00 GMT "California Sanctuary Law Upheld By Federal Appeals Court - NPR" Thu, 18 Apr 2019 22:55:00 GMT "Mueller report documents Sean Spicer and Sarah Sanders lying to press - Vox.com" Thu, 18 Apr 2019 21:29:39 GMT "Mueller assessed WikiLeaks role in fueling Seth Rich conspiracy theory - Washington Examiner" Thu, 18 Apr 2019 22:12:00 GMT "Police official: Short-circuit likely caused Notre Dame fire - AOL" Thu, 18 Apr 2019 22:20:12 GMT "The problem with Barr?s claim that Trump ?fully cooperated? with Mueller investigation - ThinkProgress" Thu, 18 Apr 2019 15:53:00 GMT "Man gets life in prison for stabbing police officer at Michigan airport - NBC News" Fri, 19 Apr 2019 02:10:00 GMT "Mueller had everything he needed to charge Trump with obstruction, but didn't - CNN" Fri, 19 Apr 2019 02:33:00 GMT "Hero dad fights off dingoes to save 14-month-old son - New Zealand Herald" Thu, 18 Apr 2019 21:22:39 GMT For more news, click here. You should select only the width and height of the image you wish and click on "Obtain Code" to see a preview of the chart how it is at the moment with the data you have chosen. 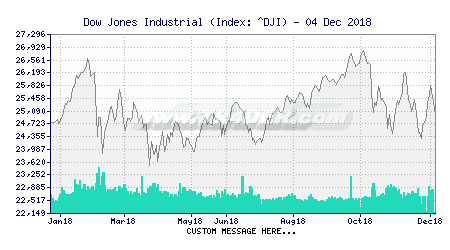 After doing that, you can put a custom text at your taste, and click again on "Obtain Code" and you'll have the final code of the chart you've made for you to put on your website.The asset is already chosen, in this case the "Dow Jones Industrial Average [^DJI]", asset, if you wish to select choose another one, you should go back to the quote page, and select another asset.